Consortium:115 KSI, consists of 115K JV (115 Construction Co. & Kowsar Water Co.), Iran Spiral Co., Kerman Tablo Co. & Shimbar Co.
§ The studies of consultant show that the transferring of iron ore, copper ore, concentrate and pelletizing from the mines to Bandar Abbas would be much more expensive than the transmission of desalinated water from Persian Gulf to the mentioned mines and industries for further processing. § Therefore, desalination of Persian Gulf water and transmitting the desalinated water is the only way to provide stable water needs of above mentioned industries. In the second part, the water will be pumped from a reservoir built at the end of first part (Gole-Gohar reservoir) by steel pipeline with Nominal Diameter of 1,400 mm, 1,500, and 1,000 mm toward Sarcheshmeh Copper Complex. 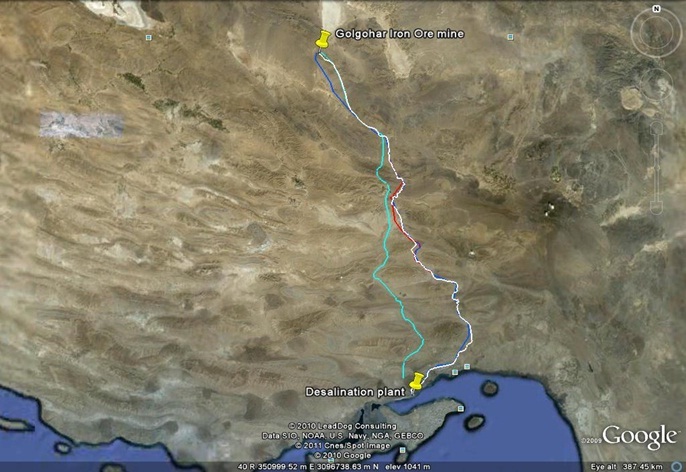 The second part with the length of 151 km will transfer the water with the flow rate of 2.7 m3/s to the Sarcheshmeh Copper Complex from the level of 1,805 m to the levels of 2,750 m from Sea level. This line has four pumping stations with the total power Consumption of 45 MW and the total pumping head is 1,250 m and the working pressure of transmission line will change from 16 bar to 40 bar over the line depending on topography conditions of path and the locations of pumping stations.